Colors: midnight blue, medium blue, red, mauve/old purple, yellow, green, ivory, maroon, aubergine, dark brown, light brown, gold brown. Design: The dark indigo blue field with scattered geometric motifs and angular flowerheads with various animal, bird and human figures surrounding a central column of angular and stepped polychrome medallions, in an ivory border of polychrome so called "calyx & leaf" motifs between madder-red and shaded blue S-motif and narrow dice-pattern outer stripes. The series of paired birds in the present rug have more realistic features as their fan-tails are shorter and they have well defined legs. This archaic drawing can be seen only on earlier examples. 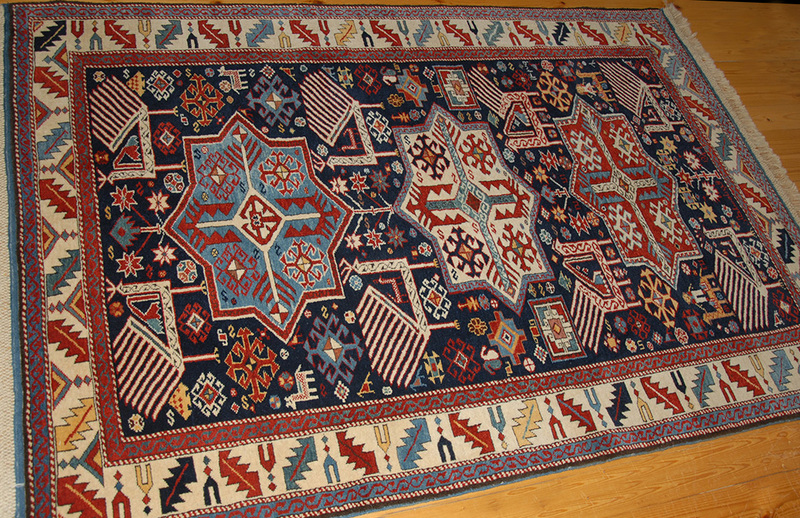 For more information about the above rug or to place an order please email vd@azerbaijanrugs.com (Baku, Azerbaijan) or ra@azerbaijanrugs.com (San Francisco Bay Area). We will get back to you within 24 hours or less.